TopConsumerReviews.com assigns a 5-star rating to Gout Gone, a leading gout relief product. With a one-year money-back guarantee and reviews from many satisfied customers, Gout Gone is the top choice when it comes to gout relief. TopConsumerReviews.com recently awarded their highest five-star rating to Gout Gone, an industry leading product for the relief of gout symptoms. Gout is a persistent, painful condition that results from having high levels of uric acid in the body. While the most common course of treatment involves prescription medication and exercise, many gout sufferers look for more fast-acting relief of their symptoms. Native Remedies’ Gout Gone takes a homeopathic approach to relieving the symptoms of gout, with an ingredient list that includes Quercus (12C), Rhododendron (6C), and Ledum (6C). To find out more about Gout Gone and other gout relief products, including reviews and comparison rankings, please visit the Gout category of TopConsumerReviews.com at http://www.topconsumerreviews.com/gout/. Native Remedies was founded by Adrienne and George Luntz in response to the increasing use of psychiatric drugs, particularly in treating children. After building a team of expert practitioners of homeopathy and naturopathy, they developed a line of Full Spectrum products that use whole herbs to deal with conditions ranging from ADHD to diabetes. More than 500,000 satisfied customers later, Native Remedies maintains a commitment to wild crafted herbs whenever possible. The company is headquartered in Florida and is a subsidiary of Silver Star Brands, Inc.
TopConsumerReviews.com, LLC is a leading provider of independent reviews and rankings of hundreds of consumer products and services. 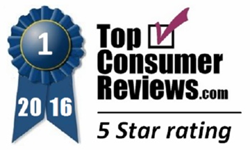 From Gout Relief to Blood Pressure and Fatigue, TopConsumerReviews.com delivers in-depth product evaluations in order to make purchasing decisions easier.